Rachel Hore worked in London publishing for many years before moving with her family to Norwich, Norfolk, where she teaches publishing and creative writing at the University of East Anglia. She is married to the writer D.J. Taylor and they have three sons. Her latest novel is THE HOUSE ON BELLEVUE GARDENS, which was published in paperback in September 2016. 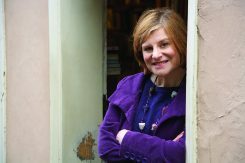 Her previous novels are THE DREAM HOUSE, THE MEMORY GARDEN, A PLACE OF SECRETS, which was picked by Richard and Judy for their book club, A GATHERING STORM, which was shortlisted for the RONA Historical Novel of the Year 2012, and the latest bestsellers, THE SILENT TIDE and A WEEK IN PARIS. Her third novel, THE GLASS PAINTER’S DAUGHTER, was shortlisted for the RNA Romance Novel of the Year 2010.